School of Mechanical Engineering, Yangtze University, Jingzhou 434023, China. 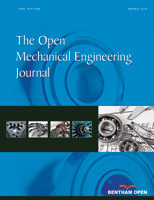 This paper proposes an innovative planetary gear reducer with overcoming the “dead point”, which is to be able to maintain expected reduction ratio by overcoming the “dead point” during the transmission motion. The motion characteristic is combined with the features of parallelogram mechanism transmission and planetary transmission mechanism with small teeth number difference. Structure analysis and force analysis of the mechanism are provided to explain working principle and kinematic feasibility of the mechanism. Three basic structure forms are proposed with a simple ring plate, two ring plates and three ring plates. In addition, the force analysis and the stress state analysis of ring plate based on a series of engineering software are carried on in detail. This study has the significance on design calculation and structure optimization of this kind of innovative planetary gear reducer.